Fr. McDermot was succeeded for a few months by Fr. William Wiley and then by Fr. James Smyth. In Father Smyth’s last year as pastor in 1848, the Church was destroyed by fire. Several months after the fire the property occupied by the Church Street Congregation Society on Church St was made available and was named “St. Mary’s”. On December 16, 1848, Fr. Philip O’Reilly, who succeeded Fr. Smyth as pastor, took title to the property and the Congregational Meeting House became the Catholic Church in New Haven. Bishop Tyler of Hartford dedicated the Church to St. Mary. This property was the site of “St. Mary’s” for more than twenty years, while preparations were being made for an edifice which should befit the important center of Connecticut Catholicism which New Haven was destined to be. This was the new St. Mary’s Church on Hillhouse Avenue, sometimes incorrectly called “the cathedral.” which was completed in 1875 at a cost of $150,000. At a St. Francis Parish meeting in October, 1880, it was decided to build a parochial school to serve the predominatly Irish Catholic Fair Haven Community. This decision was reached only twelve years after the construction of St. Francis Church. Parishioners sought to assure that their children would receive a thorough education in their Catholic faith. When the school opened in September, 1881, with an enrollment of 700 students, it was staffed by the Sisters of Mercy of the Hartford Diocese. The relationship between the Sisters of Mercy and St. Francis School was to endure for over 100 years. The Knight’s of Columbus were originally organized in New Haven. 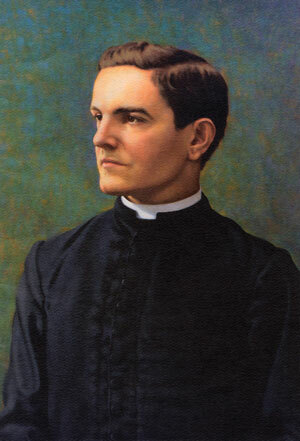 “In many ways, Father Michael J. McGivney was just one more of that band of hardworking Irish-American priests who spent themselves building up the Church in America in the latter years of the 19th century. But in one truly extraordinary respect, he was unique: Before he was 30, Michael McGivney had founded what was to become the largest Catholic men’s organization in the world: the Knights of Columbus. Knights’ success built on founder’s desire for charity. The Catholics in New Haven saw the need in the mid 1800’s to purchase land for a cemetery on the south side of Columbus Ave. near the West River. They named it “St. 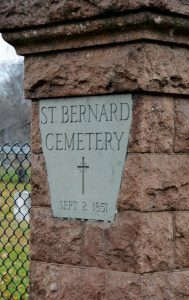 Bernard’s” and many of New Haven’s Irish immigrants are buried there. The Sisters of Mercy were responsible for establishing one of the first orphanages in New Haven. The Sisters, having arrived in New Haven the previous year, conducted a fair in 1853 for the benefit of the forty orphans sustained by the Catholic parish. Town records also note an appropriation in 1861 “of 150 dollars to the Orphan Asylum managed by the Sisters of Mercy.” The Catholic Orphan Asylum of St. Francis was chartered in 1865.